Are you keen to explore your subject interests in depth? Are you motivated by a challenge and do you like the idea of discussing your ideas with equally motivated students and teachers? If so, we’d love you to consider spending a week with us at Cambridge. The Cambridge Sutton Trust Summer Schools are week-long, subject-specific residentials, where you live and study as a Cambridge student. You’ll stay in your own private student room within a Cambridge College, eat with other Summer School students in the canteens and socialise in the common rooms. What do the Summer Schools involve? During the day, you’ll be in your academic department, where you’ll be taught by world-leading experts in your subject. They’ll guide you through new areas of study, introducing you to the depth and breadth of a Cambridge undergraduate course. The subject timetables are varied: you might undertake your own research project, participate in seminars, laboratory sessions or fieldwork, go behind-the-scenes at museums or test out Cambridge’s supervisions (specialised, small-group teaching). But it’s not all work. After you leave the departments, you’ll have time to explore Cambridge with your Summer School friends, and we’ll put on a host of activities for you. You’ll get to go on a chauffeured punt tour of the River Cam, take part in a range of sports and societies, and enjoy a ‘Formal Hall’ and quiz on the final night. By the end of the week, we hope that you’ll leave inspired by your subject, with new knowledge and skills which will stand you in good stead for your final year of school. We hope, too, that you’ll be able to make an informed decision about what you want to do next, whatever subject, university or route you’re considering. 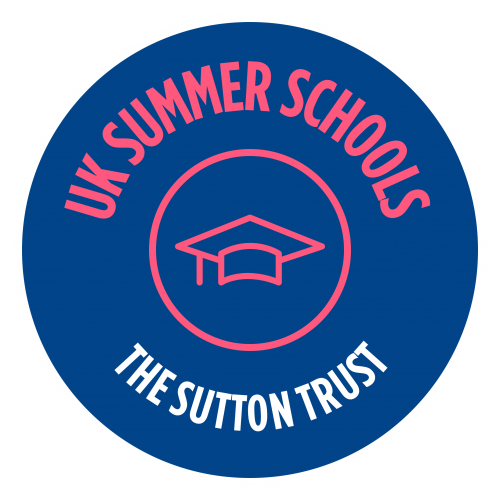 The Sutton Trust Summer Schools are extremely competitive and we aim to ensure that places go to those will take the most away from the experience. It is essential that participants take part in the entirety of the event. Students who have holidays or commitments which overlap with the Summer School they hope to take part in will not be permitted to attend. Additionally, if you are attending multiple events at the University or its Colleges, you may find that some of the content is repeated. We will send you the timetable for your subject as soon as it is available, please ensure that you take a look and let us know as soon as possible if you would like to withdraw your place on the Summer Schools.